In this series of blogs, I’m going to try list the differences between Project 2013 and Project 2016 – I’ll be comparing the Professional versions so if you’ve got the standard version then not every change will impact you. Also, I’m not going to be concerned with UI changes (unless they are significant), rather I will try and deal only with features/functionality. Currently not sure how many blog’s I’ll run, I guess it depends on how many changes to the client I find! This only impacts Project Professional 2016. The online status feature is what used to be known as Lync integration, but since that time Lync has changed it’s name to Skype for Business, and so Microsoft appear to have taken the sensible decision to keep the feature name generic and refer to it as online status! Feature description – when turned on then the online status of the resource is shown next to the resource name. This occurs wherever the resource name is displayed (Gantt Chart, Resource sheet etc), and allows instant communication with the resource using Skype for Business. However, the problem with this is that a window pops up when you mouse over the resource name, and this window can be quite intrusive when editing a project. 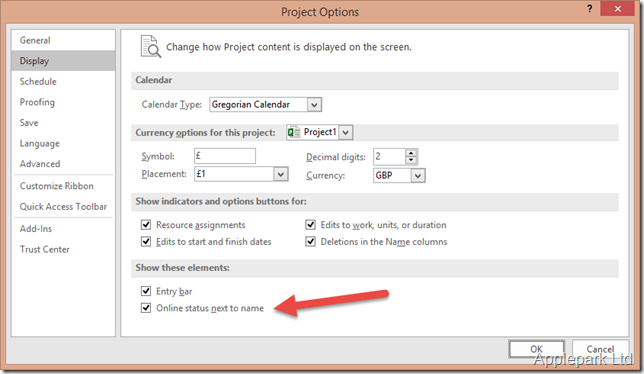 Other information – if you want to turn this feature off in Project 2013, then you need to edit the registry. Add a key called DisableIMStatus to the HKEY_Current_User\Software\Microsoft\Office\15.0\MS Project\Settings and set it to 1. To turn it on again, reset to 0 and restart Project.